It was all fun & GAMES this Halloween! We decided to dress our crew of 5 boys as their favorite board games this Halloween! Pictured are my two sons and my 3 nephews ranging in ages from 1-8 years old! Monopoly is Ryder, 6 years old and he is obsessed with playing Monopoly, so this was an easy choice for him! He loved his giant monopoly piece cane we made from a monopoly bank we found. It was fun gluing on all the pieces and play money! Pie Face is being worn by Shane who is 5 years old! He loves that game and it was so fun to make! We made a table out of an art canvas and painted with a wood grain tool, glued the actual game to table, enlarged the pie face piece you put your head through and used foam insulation for the whipped cream! It looked so real! People loved seeing his costume, they all went crazy! Battleship is worn by cousins Sawyer & Rain who are both 1 years old! 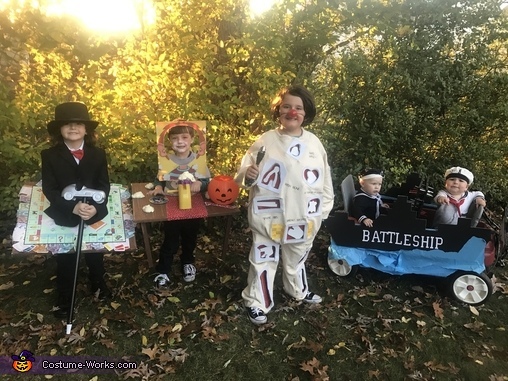 We needed a costume we could use a wagon with a Battleship was the perfect choice! A peg board was used to crest the game, dowels were painted for the pegs and giant battleships were cut from foam core, everyone couldn't get over how original this costume was! Needless to say "game night " was a blast!